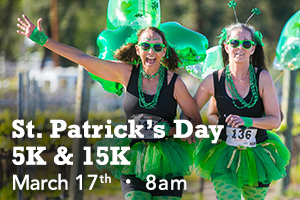 Lace up your running shoes for the 7th Annual St. Patrick’s Day 5K & 15K on March 17th. Walk or run this challenging, hilly course that takes participants through country roads and the Cougar Vineyard & Winery in beautiful Temecula. Enjoy a glass of green bubbly at the finish line (21+) and receive a cute green succulent! A portion of event proceeds support the Rose Again Foundation to benefit orphans and foster children in the Temecula region. All ages are welcome to participate in this festive family run! This entry was tagged audie murphy ranch, brookfield residential, City of Menifee, Menifee Events. Bookmark the permalink. ← Get Revved Up for the Temecula Rod Run!